Bright and early Tuesday morning, we made our way to Disney Paris. 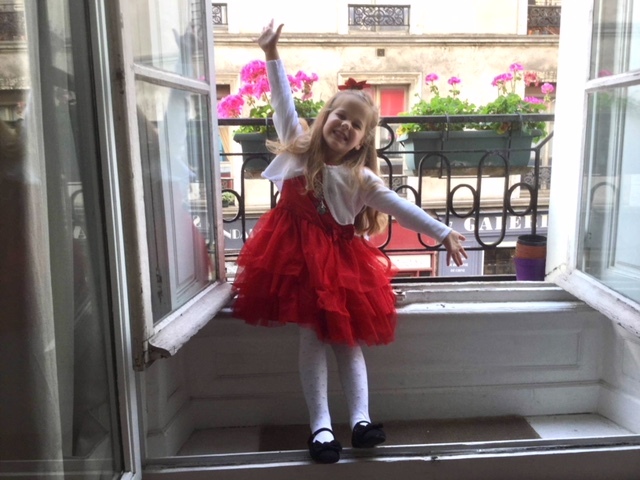 After going through the scenario of an early-morning train ride with the kids and my parents, we wisely hired the driver from Allonavette a second time and were dropped off close to the front gates around 9:30am. Technically the park opens at 10, but we were told the gates may open up to a half hour early. I know Disney can be quite divisive, but my family and I are firmly in the “Disney lovers” camp. JR on the other hand, not so much. He played along for the sake of the kids and even smiled once or twice for pictures. We walked to the back of the park to start the day in Adventureland. 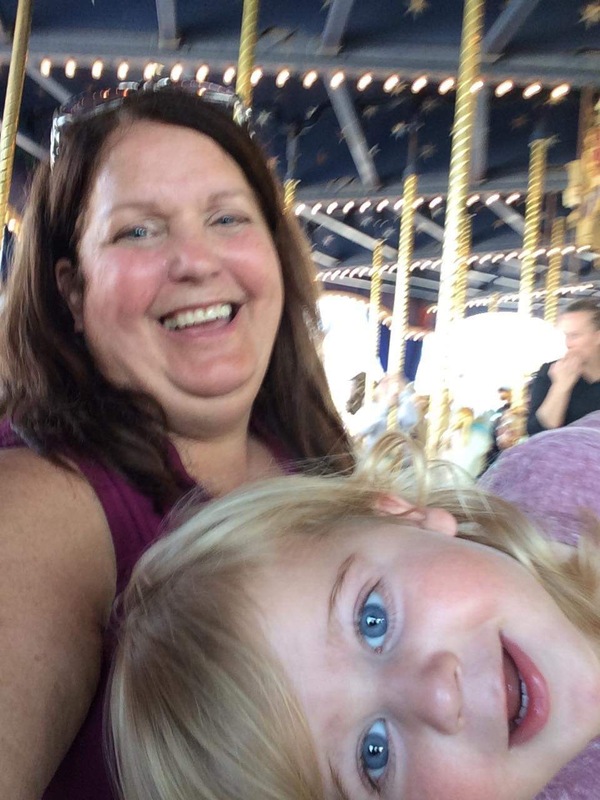 Instead of being excited by Dumbo or the other rides, Abby asked when she could see a princess. We were right beside the Princess Pavilion and the sign said you could meet Snow White with only a 60 minute wait. I tried to discourage her, thinking no way would she want this to be the very first thing we did, but she was determined. So in we went. To her credit, she did not complain once while we waited every minute of that hour. 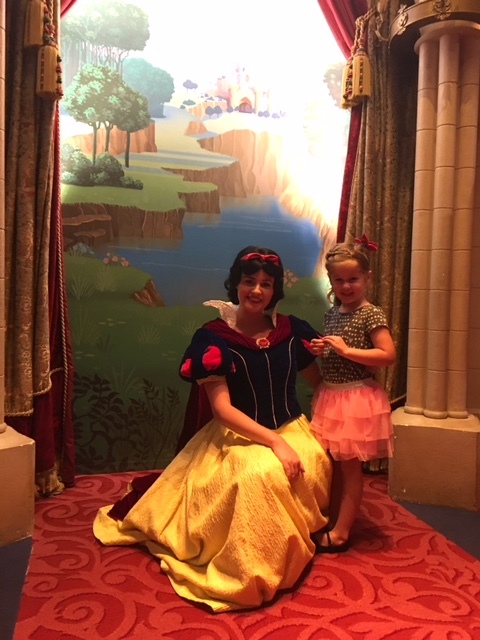 I’m not certain how there were already that many people in line for a 60 minute wait but she was thrilled to meet Snow White. 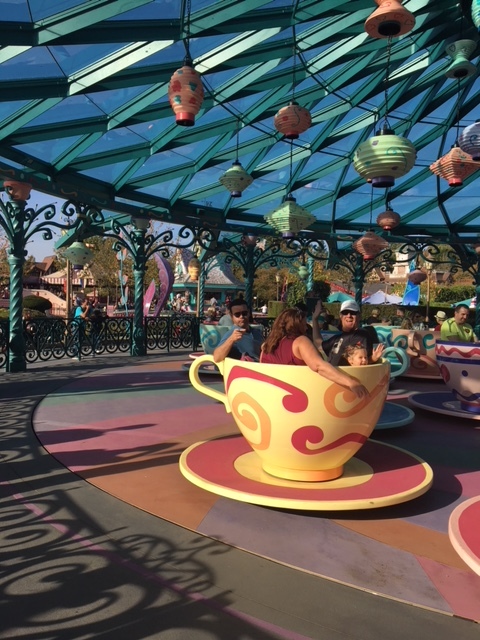 Meanwhile, JR was living his best life, riding the Tea Cups and It’s a Small World with his in-laws and William. William is quite the talker these days and loved pointing out some of the animals on the rides. 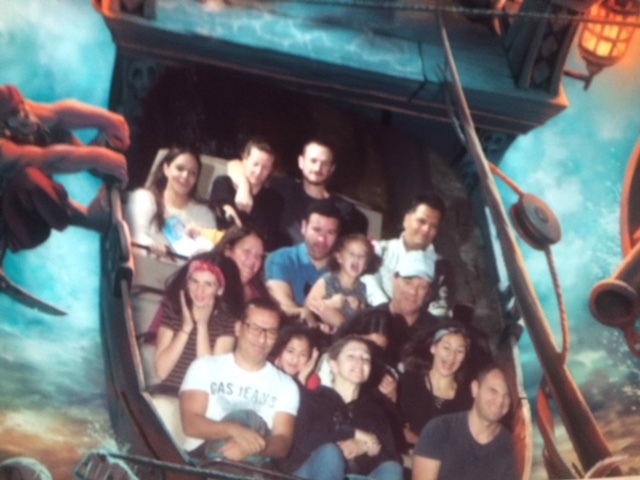 After our princess encounter, we joined everyone else for a few rides before sitting down for lunch. We’d packed peanut butter sandwiches and snacks for the kids, but assumed we could buy cheap, quick-service food at the park. Well it was available but it definitely wasn’t cheap and it tasted pretty terrible. The only food place close to where we sat down was serving some version of a sausage, with some funky red sauce (not even close to ketchup) and fries. Ready to tackle the afternoon, we made our way to Fantasyland to find Pirates of the Caribbean. I was so disappointed to see a sign saying expecting women couldn’t ride, so I kept William with me while everyone else went ahead. 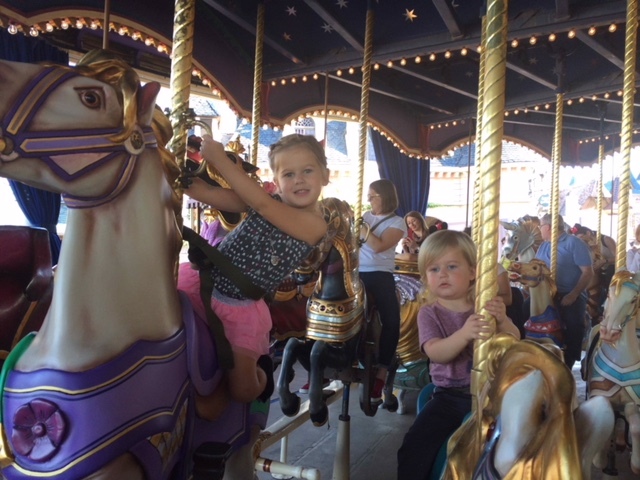 Abby said this was one of her favorite rides of the day and even JR said it was fun! Then it was time for the Halloween Parade! The parade was a little underwhelming. They danced and sang, but there were only a few floats. They spread out and stopped and did their performance and then it was over. 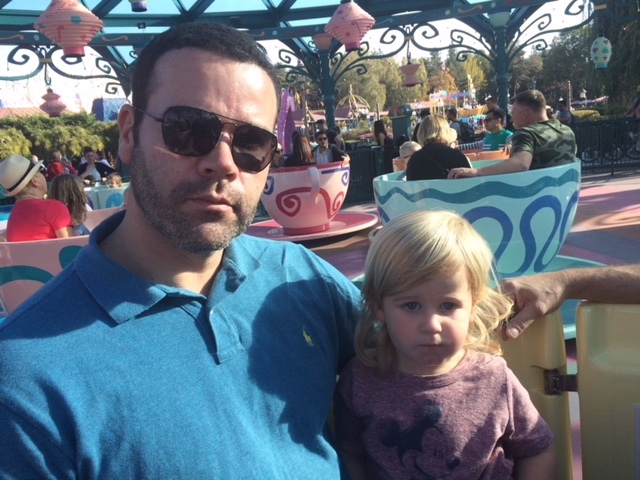 We walked to a Pinocchio ride, which is when William woke up and basically lost his mind. 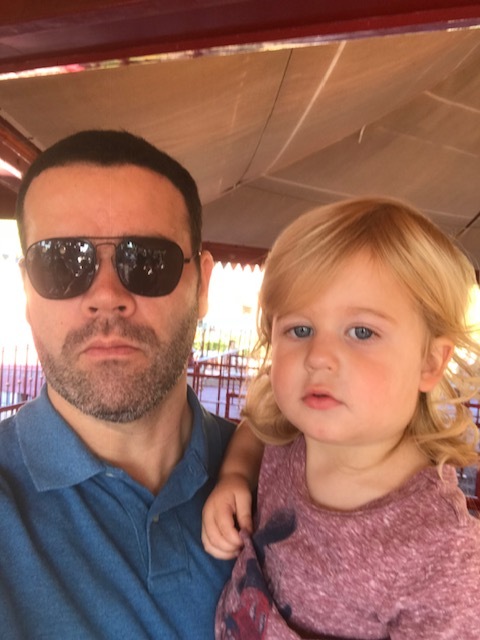 JR saved the day by whisking him off to the carousel – although he was very displeased when that ride ended. Luckily my mom and Abby were in line as well so he joined them for another round. Oh so conveniently located near almost every ride was a store selling overpriced Disney goods. My grandma sent both kids a little spending money and it was burning a hole in Abby’s pocket. I left her alone in the store with my mom for about 15 minutes, which was apparently plenty of time for a purchase and complete outfit change. The rest of the day passed quickly. We rode a few more rides, watched two more parades and a short show, and had a very sub-par dinner. Around 6 or 7pm JR and I were ready to call it. My parents could have gone on for several more hours, I’m sure, but by the time we boarded the train to go home it was clear we were all spent. The train was completely packed, we were really lucky to get seats because it was about a 45 minute trip back to the city. Overall, I’m really glad we went! 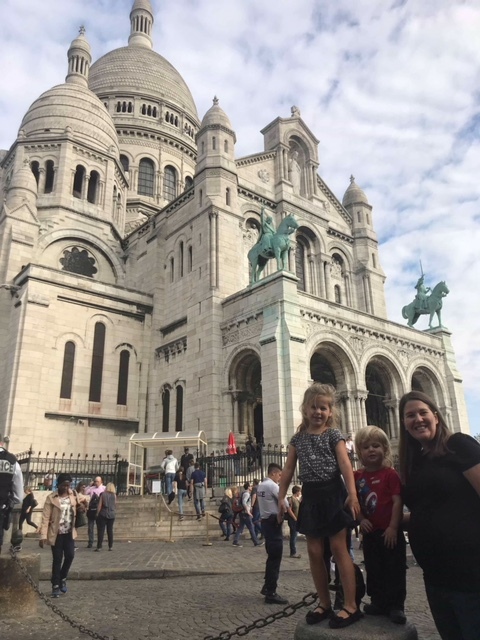 The next morning JR and I took the kids to Monmartre to ride the little train around the neighborhood. The kids loved it. 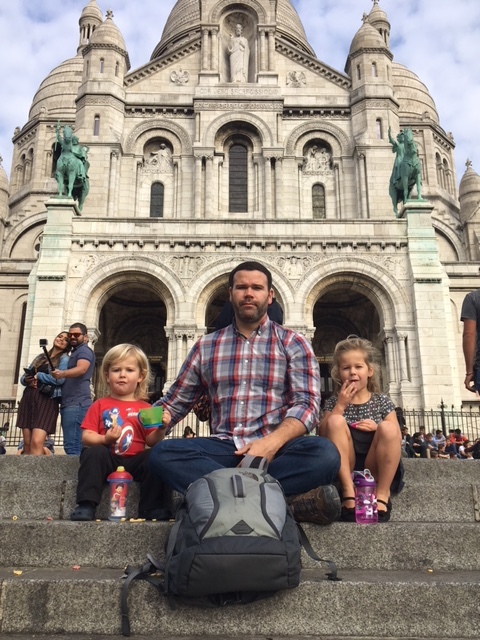 We rode it up to the Sacre Coeur (one of my very very favorite places in the world!) and we enjoyed the view and some snacks. We told the kids the story of how we sat on those very same steps on New Year’s Eve in 2013 when I was pregnant with Abby. They weren’t that impressed and were only interested in their snack cups. On the way back they took turns napping in their strollers as we walked through the neighborhood. 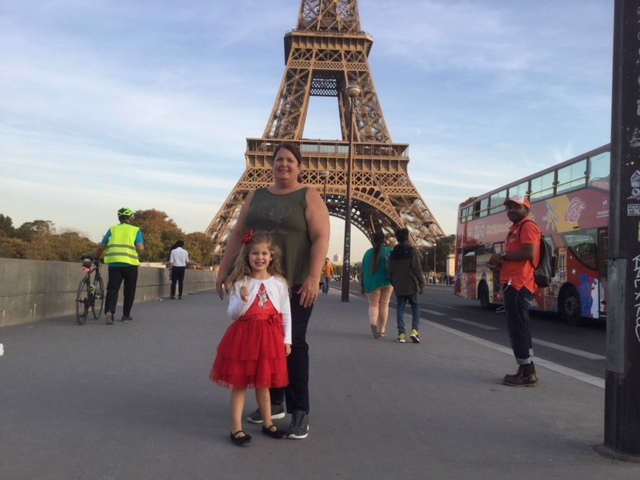 Leading up to the trip, Abby was insistent that she wanted to not only see the Eiffel Tower at night, but that she wanted to go to the top. 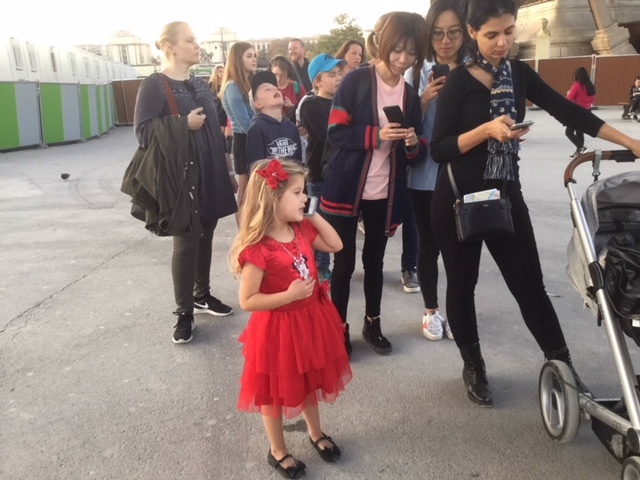 We kept an eye on prices for Skip the Line tours, but they were expensive and I’d read that you could wait hours if you just showed up without a ticket. 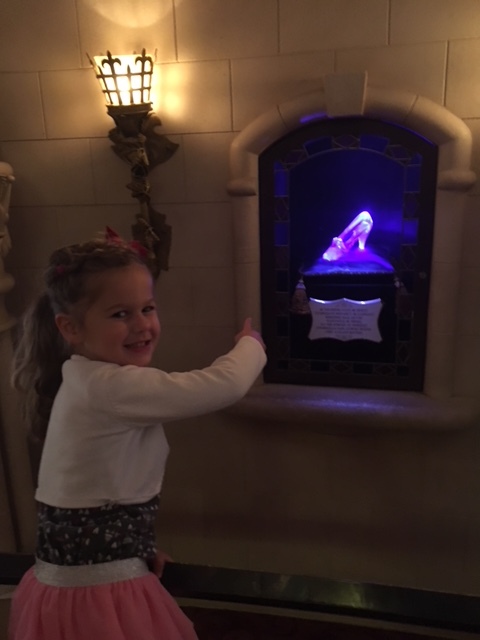 We thought she might be satisfied by our trip to see it when we arrived, but the girl would not be deterred. 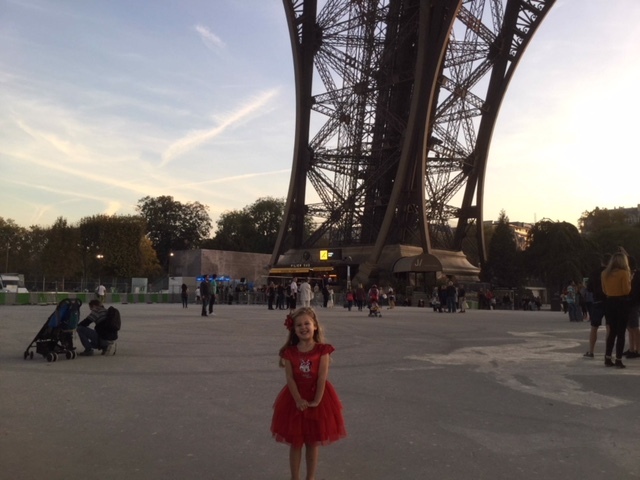 My parents offered to take her that evening and Abby will still tell you it was one of the best parts of her trip. 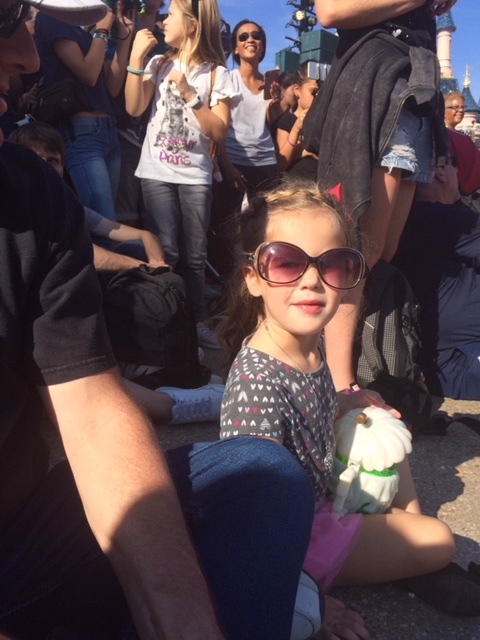 She called JR and I a few times from the line from my Mom’s phone, just to keep us updated, and she was absolutely adorable. 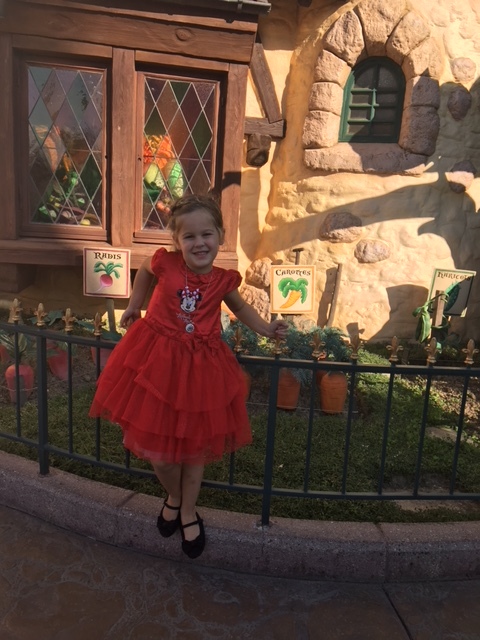 She also just HAD to wear her “best” dress (the new Minnie Mouse one she purchased and wore the day before). 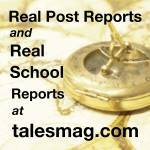 Thursday was our last real day. JR spent the morning at the Catacombs while my mom and I took the kids to a playground. My parents offered us a final date night in the city and we weren’t about to turn that down, so we rushed out of the apartment before they could change their minds. 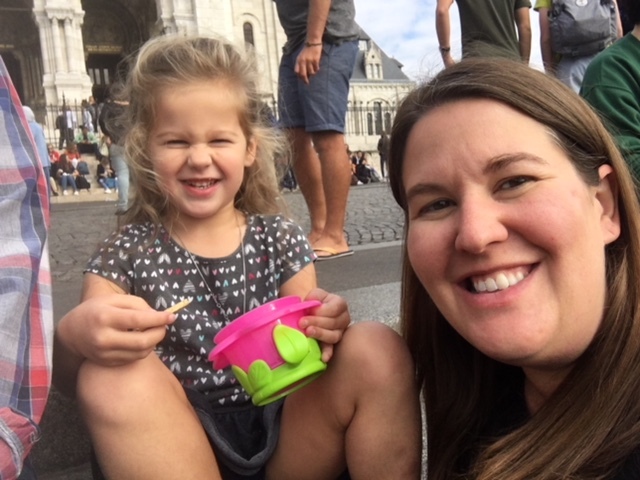 We walked over to St. Germain and enjoyed a few hours of walking without strollers and backpacks full of kid supplies. We had a very French dinner (fondue for me, rabbit for him) and then enjoyed one last crepe that can hopefully tide me over until our next visit. Friday was departure day for everyone. One downside to our AirBnB was that it had a 10am check out, and we couldn’t do a late checkout (or so we thought) because they had another booking that day. Our return flight didn’t depart Paris until 9:20pm, so we rented a day room at the Hilton near the airport. Our room was huge, and they also brought in a pack n play for William. The hotel had a small pool which claimed to be heated but wasn’t exactly warm and the kids loved it anyway. 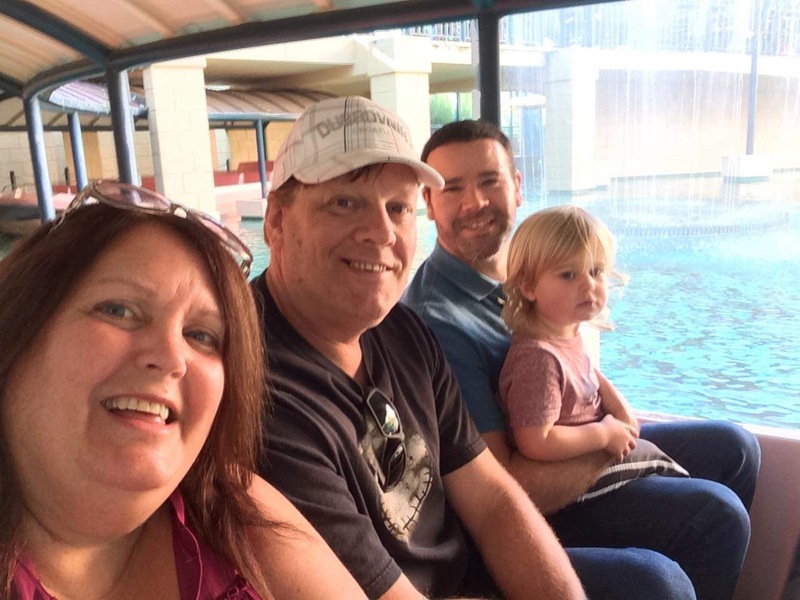 We all took a long nap, watched some French cartoons, ate dinner at the hotel and then took the free shuttle to the airport. Thankfully the guy eventually quieted down once we took off and the flight home, overall, was fine. William passed out in my arms and Abby eventually fell asleep in her seat. I knew from our experience in London she would be a beast when it was time to wake up and get off the plane. I handed William to JR and starting waking her, with the promise of cookies if she would just wake up and walk off the plane herself. She did, and when we got on the bus to take us to the airport William woke up and started saying “Cookie? 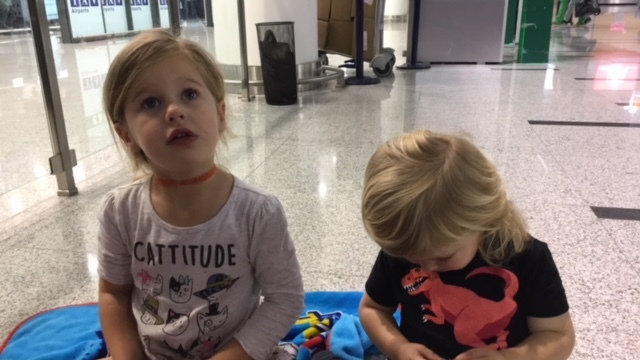 Cookie?” And that, my friends, is why my children were on the floor of the Tbilisi Airport eating cookies at 5am a few weeks ago. Because it’s all about survival.